The Legend of Zelda: A Link to the Past is not only one of the most influential action RPGs of all time but also one of the best in gaming history. With that in mind it is a bit odd that it inspired so few clones during the 16-bit era. While most would point to Crusade of Centy as the most egregious copycat Gunple: Gunman’s Proof takes that title in my opinion. Its late release in 1997 is the main reason it has such a low profile but its Japan only status is also a factor. That doesn’t matter now however thanks to a fan translation, allowing more to experience this hidden gem. Though flawed Gunman’s Proof is still a pretty great game. Gunman’s Proof shifts the setting a few hundred years to the old west. In 1880 two meteorites crash on Earth and immediately begin to cause the appearance of creatures dubbed Demiseeds. One day a boy from Bronco village happens upon a UFO whose two inhabitants inform him that they are space sheriffs on the trail of a criminal named Demi they believe came to Earth. One of the aliens, Zero, inhabits the boy’s body to search for Demi thus beginning the quest. The tone is definitely wacky and if the goofy title screen and music did not give that away then the interactions with the town’s inhabitants will drive it home. This is a world where no one bats an eye at a 10-year running around with a machine gun cocked and loaded. The gun shop owner gleefully teaches you how to use even more outlandish weapons such as flamethrowers, shotguns, and even a bazooka. There are even martial arts masters who will teach you new combat techniques such as a charged shot and a shoryuken (I’m not joking!). The humorous tone is carried on in the game’s graphics. The art style is even cartoonier than its inspiration with extremely bright colors being the rule of the day. 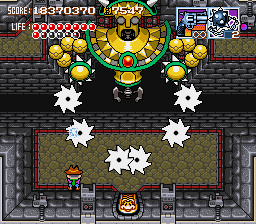 The enemy sprites are well animated and extremely detailed, especially the bosses. These massive contraptions are the game’s visual highlight as they are quite unlike anything you have seen before. That being said there is no denying that once you enter a dungeon Nintendo could have sued for plagiarism as they look near identical to a Link to the Past. Not just a little. A lot. Those similarities begin to disappear the further you progress but the HUD is a constant reminder of the game’s source material. Luckily the game’s setting allows for some gameplay differences. You have a separate button for ranged and melee combat with various weapons that will augment both. Admittedly your fists can’t match up to the infinite ammo gun since you can shoot in 8 directions and can perform a stronger charged shot. It’s clear the game was designed around gunplay as you can strafe and crouch and crawl to dodge bullets. Combat is the primary focus and the game provides plenty of options in that regard. You won’t be carrying around an inventory of items; all sub weapons drop from enemies and are temporary. It sounds limiting but weapon drops are so frequent you’ll rarely have to rely on your default items. To an extent this almost feels more like a typical action game since you have lives, ammo, a limited stock of smart bombs, and even a score. That these elements were adapted to this style of game so well makes it feel unique. Gunman’s Proof goes to great lengths to replicate A Link to the Past in both its looks and gameplay so it is disheartening to see it fail in the most crucial area: its dungeons. The absence of any puzzles or special items needed for progression means you can simply head directly toward the boss if you know the exact route. In fact the game rewards you for clearing the dungeons as fast as possible. Not to say that those elements are absolutely necessary in an adventure game but their absence leaves exploring the dungeons a hollow experience. The few treasure chests you’ll find merely contain treasures used to obtain a higher score in order to earn extra lives. Very rarely will you find a permanent weapon upgrade. The lackluster dungeons wouldn’t stand out so much if they were not the main thrust of the game. There is very little impetus to explore the overworld as any items such as life increasing red coins will be found on the way to the next dungeon anyway. There are a few hidden skills to learn but they serve little practical use in combat. Despite the size of the map the world is actually quite small. With dungeons that can be cleared in 10 minutes or less the game falls on the short side. Yet in spite of all these faults it still nails its core gameplay. The game is worth checking out just to see what Zelda would be like in a different setting. You’ll pick up an interesting combination of weapons and skills that cater to those who like hand to hand combat (so to speak) or to fight from a distance. The frequent weapon drops mean you’ll never have to worry about ammo and can freely change almost whenever you want. While it is true that you can blitz each dungeon at the very least you’ll have fun doing so. Between the number of extra lives you’ll amass and the constant food drops Gunple falls on the easy side. The game is a bit too generous with food; there were times I was on the verge of death and within seconds almost refilled my life bar. Midway through the game weaker enemies are replaced with more active demiseeds that aggressively fight back but that does little to ramp up the challenge. A good bit into the game and you can find the red bandana, which cuts damage in half while doubling your attack power. Insane. The only real test comes from the game’s bosses. Their patterns are simple but your hit box is large which makes dodging fire in tight spaces a nuisance but it doesn’t matter. If you have spare lives you are revived on the spot much like fairies in Zelda. At least they look cool. Gunman’s Proof is a good stab at replicating the Zelda formula but misses a few of the essential elements that make that series truly special. The areas in which it differs are where it shines brightest, i.e. its story and combat. It has its flaws but is still more than worthwhile for any fan of adventure games. Unfortunately some Japanese is required as you are given specific instructions and need to complete certain objectives in a given order. However there is a fan translation for those willing to emulate and I say it’s worth it.